It was fundamental baseball from Orlando's Jose Marzan, The Orlando Sentinel wrote, and it helped lead to an Orlando win. In this April 1990 contest, Marzan slid hard into second to break up a double play and keep a rally alive, The Sentinel wrote. "That's a good sign of being successful in the basepaths,'' Orlando manager Ron Gardenhire told The Sentinel after the win. ''We had been taking ourselves out of games with mistakes." Marzan broke up that double play in his fourth season as a pro. He only played in one more. Since then, Marzan has gone on to a long career as a minor league coach, manager and coordinator, helping teach baserunning and other skills to younger players. 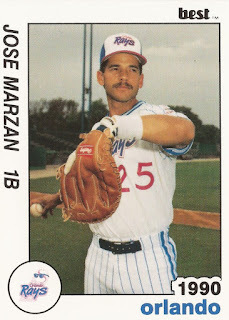 Marzan's career in baseball began in 1987, taken by the Twins in the 16th round, out of Florida State University. At Florida State, Marzan helped his team to the 1986 College World Series and the 1987 College World Series. In 1986, Marzan and the Seminoles made it to the championship game. "Last year, none of our guys had been there before, and we came in second,'' Marzan told The Orlando Sentinel in May 1987. "If you have the players to win a championship, that's what matters." With the Twins, Marzan started at single-A Kenosha, hitting .255 over 32 games. He played 1988 between Kenosha and single-A Visalia, then 1989 completely at Kenosha. For 1990, Marzan made AA Orlando. Over 77 games, Marzan hit .230, knocking in just 16. His final season came in 1991, with 84 games back at Orlando. He hit .262. Then Marzan turned coach. In 1992, he served as hitting coach with the Twins in the rookie Gulf Coast League. In 1993, he was manager there. Except for a stint as hitting coach at high-A Fort Myers in 1995, Marzan continued as a manager in the Twins system through 2004. He is most recently listed as the Twins Latin America coordinator in 2009. In 2004, Marzan served as manager at Fort Myers, trying to help a young Danny Matienzo with his swing. Marzan was patient, according to The Naples News. "Not many guys at this age have power," Marzan told The News. "Matienzo has power, but it takes time."